Using additive manufacturing to produce complex shapes that are otherwise hard to fabricate has led to the misconception that any 3D model can be identically 3D printed. 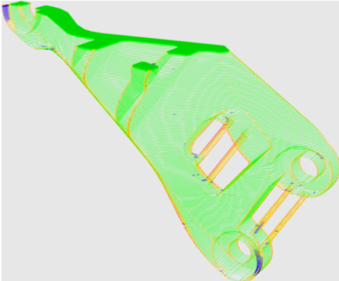 Analyzing manufacturability in terms of printable geometry allows designers to make informed tradeoffs between design complexity and manufacturing capability. PARC’s web-based Makesim technology introduces novel geometric reasoning techniques to automatically plan, simulate and visualize the output of the 3D printing process as a solid model which can be inspected virtually and redesigned. The printability and quality of the as-manufactured model may be evaluated and customized on different machines and processes, enabling unprecedented speed-up from planning to part delivery. The technology is agnostic of part geometry and can accurately compute ‘as-manufactured’ models based on custom printer specifications and can also predict additional material to be added at locations where designs are not manufacturable. Digital Design and Manufacturing is a Focus Area for PARC. We have in-house expertise in CAD/geometric modeling, artificial intelligence (AI), machine learning, control theory, reliability and systems engineering, knowledge representation, and more. To execute a digital manufacturing project successfully, a subset of more than one of the above-mentioned skills is often required. The ability to offer such multidisciplinary teams is one of the unique aspects of engaging with PARC. Figure 1. Visualizing as-manufactured models in MakeSim. Features below printer resolution are shown in red, features below recommended wall thickness (but above printer resolution) are shown in yellow. Left and middle images show model thickening (blue) at thin walls below printer resolution. Sharp corners are not printable in general and therefore not corrected. MakeSim allows visual/automatic comparison of models printed in multiple orientations/processes. Right image shows a visualization of the layered build process.